The March jobs report released this morning by the Bureau of Labor Statistics was a big, negative surprise and underscored that a robust jobs recovery has still yet to materialize. The job growth of 88,000 in March was far lower than the 2012 average increase of 183,000. It is important to keep in mind that the month-to-month numbers can be volatile, however; in this case the first quarter average growth rate is likely a better measure of the underlying trend. But at 168,000 per month, this first quarter average is not even close to adequate; at that rate, we would not return to the prerecession unemployment rate until late 2019. To get back to the prerecession unemployment rate in three years, we would need to add 320,000 jobs every single month—almost double our current rate. The unemployment rate ticked down to 7.6 percent in March, but not for positive reasons. The decline is due to people dropping out of the labor force, not an increase in the share of the working-age population with jobs. In fact, the labor force participation rate dropped to its lowest point of the downturn, 63.3 percent. What’s more, this weak labor force participation is not due to demographic factors such as retiring baby boomers; the labor force participation rate of the “prime-age” population, people age 25–54, is also at its lowest point of the downturn, 81.1 percent. It’s the lack of job opportunities—the lack of demand for workers—that is keeping these workers from working or seeking work, not other factors. The Congressional Budget Office estimates the current size of the “potential labor force”—how many workers would be in the labor force if job opportunities were strong—at around 159 million. The size of our current labor force is just 155 million. In other words, about 4 million workers are “missing” from our workforce. If those workers were in the labor force looking for work, the unemployment rate would be 9.8 percent instead of 7.6 percent. Currently, the unemployment rate is hugely underestimating the amount of labor market slack. Even with the declines in the unemployment rate, it is still extremely high—it has now been 7.6 percent or higher for more than four years. (In comparison, the highest unemployment rate in the two recessions prior to the Great Recession was 7.8 percent, for one month in the early 1990s downturn.) Persistent very high unemployment exerts strong downward pressure on wage growth, since the existence of so many unemployed workers relative to job openings, along with a lack of outside job opportunities for workers with jobs, means employers do not have to pay substantial wage increases to get and keep the workers they need. Average hourly wages for all private-sector workers increased by just 1 cent in March, and by just 1.8 percent over the last year—a big drop from the prerecession rate of wage growth (see the figure below). The “underemployment rate” (officially, the U-6 measure of labor underutilization) is the Bureau of Labor Statistics’ most comprehensive measure of labor market slack. It includes not just the officially unemployed and the marginally attached (jobless workers who want a job and are available to work but have given up actively seeking work), but also people who want full-time jobs but have had to settle for part-time work. This measure decreased from 14.3 percent to 13.8 percent over the last month, largely due to a 350,000 decline in “involuntary” part-time workers. After increasing from last spring to last fall, the number of involuntary part-timers, at 7.6 million, is now back down to just under where it was a year ago. It remains much higher than before the recession began, however; in 2007, the average number of involuntary part-timers was 4.4 million. Average weekly hours of all private-sector workers also increased by one-tenth of an hour in March, and is now back to its prerecession level of 34.6 hours. The public sector continues to shed jobs, losing 7,000 on net in March. The big public-sector job loser in March was the U.S. Postal Service, with a decline of 11,700 (this was partially offset by gains in state government employment in March). Since the recovery began in June 2009, the public sector has lost 720,000 jobs (with nearly half of that, 352,000, in local public education, which is basically public K–12 education). These losses continue to be an enormous drain on the recovery. Another big loser in March was retail trade, dropping by 24,100. The average rate of growth of the last six months, 23,500, is likely closer to its underlying trend. Construction added 18,000 jobs in March, a decline from the 49,000 February increase, but that was expected since the February increase was likely boosted significantly by warm weather. Manufacturing declined by 3,000 jobs, after adding 15,300 on average over the prior three months. Health care added 23,400, in line with its average increase of 24,500 over the prior three months, and temporary help services added 20,300, also not far off its average increase of 15,800 over the prior three months. Restaurants and bars added 13,000, down slightly from its 24,200 average gain of the prior three months. 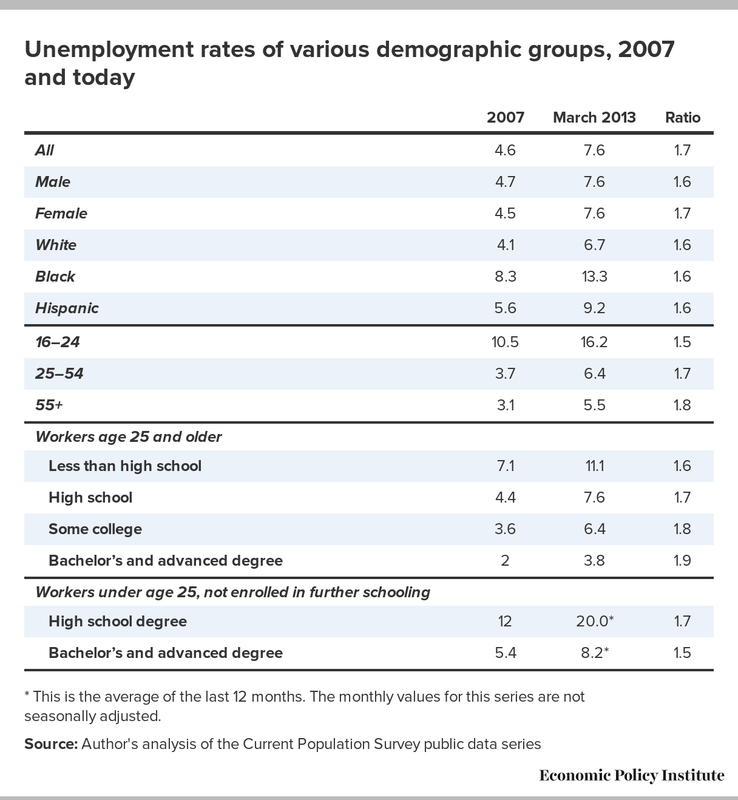 The table shows the current unemployment rate and the unemployment rate in 2007, along with the ratio of those two values, for various demographic groups. While there is substantial variation in unemployment rates across groups, in every group the unemployment rate is between 1.5 and 1.9 times as high now as in 2007. Notably, the unemployment rate of workers with a college degree is substantially higher today than before the recession. This underscores that unemployment is high today not because workers lack adequate education or skills, but because a lack of demand for goods and services makes it unnecessary for employers to significantly ramp up hiring. * This is the average of the last 12 months. The monthly values for this series are not seasonally adjusted. Despite ongoing improvements, the labor market still has a deficit of close to 9 million jobs, and the lack of demand for workers means labor force participation is low, unemployment is high, and wage growth is depressed. Today’s report was a reality check; there is no sign of momentum in the labor market or acceleration in job growth. The nation’s labor market remains weak, and we continue to need aggressive fiscal stimulus to create jobs. Instead, Congress and the administration were unable to avoid sequestration, adding to the already-considerable fiscal drag on the economy, which was not a big factor in today’s report but will reach full force this spring and summer.